The dream of an extra room in your house without any structural work could become reality! A garden shed sewing room, studio or office could be achieved more easily than you think. This is where a creative approach and some 3D home design software can really come into their own. Converting a storage shed into an office, assuming the existing space is large enough for your needs, is all in the planning. 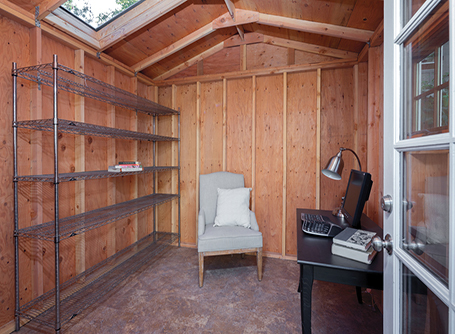 From top to bottom and from inside to outside, here’s how to build an office shed. From the top: is the roof sound or does it leak? If it leaks you may need to replace plywood covering over the roof timbers and over that, new felt. If it’s sound, you only need to consider insulation. You can check how to build an insulated shed in your DIY manual, but basically you need to add four inches of insulation to the internal batten framework of ceiling and walls to keep your environment warm in winter and cool in summer. The last structural stage to turn a shed into an office is the floor. Concrete is cold so, if possible, lay a chipboard floor over a layer of insulation. Now for the inside. Ideally your desk or workbench should face the window for good lighting and a relaxing garden view, but your layout depends entirely on your use of the space. Use the rafters for central lighting but be sure to have plenty of secondary light sources to make the space bigger and homelier. A colourful rug in the place where your feet will rest while you work will add depth and cheer and help to keep you warm and comfortable. Use a 3D apartment plan to play with different layouts and ideas; this really helps to visualise how you will move between spaces, their relationships and how the light will fall on various areas. An added advantage of 3D home design free software is that you can exchange ideas with the thousands of others in the UK embarking on a similar project to yours. It’s all part of the fun and is sure to bring inspiration! If the roof leaks, replace plywood over the roof battens topped by a new layer of roofing felt. Check for damp every year and replace when necessary. For a classic wooden shed, fill the gaps between internal battens with 4” insulating material on ceiling and walls. Cover the insulation with plywood for a smooth finish. Cover a concrete floor with chipboard or flooring timber. Either way, your floor will be warmer. Leave headroom for a ceiling height of the recommended 2.2 metres. In addition to the window and central light, add several secondary light sources to give the space depth. It will feel cosier too. Use a 3D free plan to help you design your space according to your working needs. You will also gain inspiration from thousands of others tackling a similar project!